Great to see work going well ahead of the big bash planned for October across Ireland for the Startup Gathering. 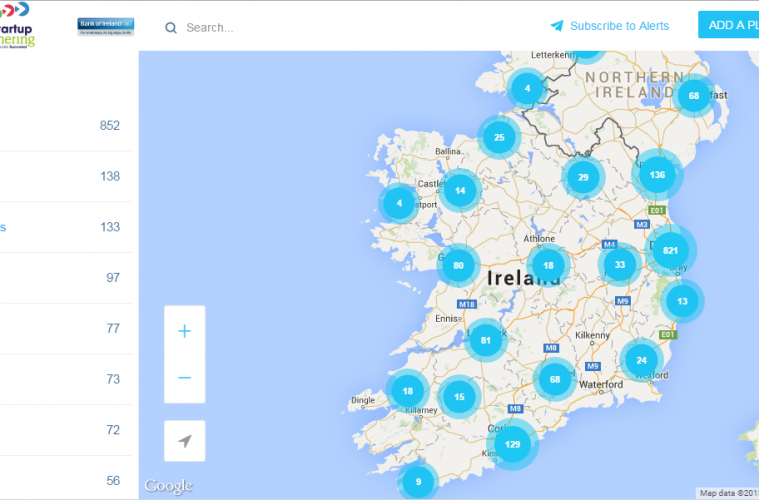 Here’s the latest addition to the plan, an interactive online map for Ireland’s startups. Startup Ireland, the national not-for-profit organisation dedicated to championing the growth of the startup sector throughout Ireland, has launched a new interactive online map of Ireland’s startup ecosystem. The most comprehensive view of Ireland’s startup ecosystem, the map features crowd-sourced data, providing home-grown and international startups with a useful, visual guide to the startups, resources and supports available across Ireland. Mapping startups, networks, incubators, accelerators, co-working space, funding sources, tech transfer offices, research centres, multi-nationals and more; the online interactive map is being continuously updated with crowd-sourced data from Ireland’s startup sector. Managed and curated by Startup Ireland, the map currently features more than 850 startups, 137 supports, 70 networks, 70 co-working spaces, 100 services and 130 multi-nationals. Startups and organisations providing supports to startups can add their details to the map http://mapme.com/startupireland. In addition to giving an all-Ireland view, the map also provides city views of startups and supports available in Dublin, Cork, Limerick, Galway, Waterford, Belfast and Derry. The map of Ireland’s startup ecosystem is being developed as part of Startup Gathering 2015, Ireland’s national startup week. Taking place across Ireland from the 5th to 10th October, over 50 events are being planned over 5 days, 5 industries and 5 cities; Dublin, Cork, Galway, Limerick and Waterford. With the theme ‘Start, Scale and Succeed from Ireland’, Startup Gathering 2015 aims to promote entrepreneurship and help develop world class regional startup hubs around the existing industry strengths in each region to accelerate the growth of startups and scaleups in Ireland. It is also focused on raising the profile of Ireland’s startup sector to global entrepreneurs, investors and R&D teams and is a key building block towards making Ireland a global startup hub by 2020. Led by Startup Ireland, Startup Gathering 2015 is a major initiative of the Government’s Action Plan for Jobs 2015, and a key building block towards making Ireland a global startup hub by 2020. Startup Gathering 2015 is supported by the Department of Jobs, Enterprise and Innovation and Bank of Ireland, a key strategic partner. The Startup Gathering National Steering Group, chaired by Minister Nash, which includes representatives from Bank of Ireland, Enterprise Ireland, IDA, Science Foundation of Ireland, Ibec, Bord Bia, Irish Universities Association of Ireland, Department of Foreign Affairs have all made significant contributions to the map. Startup Ireland is a national not-for-profit grassroots organisation dedicated to championing the growth of the startup sector throughout Ireland and to the goal of making Ireland a global startup hub by 2020.